Pending Dr. Lester’s arrival in November, Dr. Sanchez serves as the interim department chair. A professor and large animal internal medicine specialist, has been a member of the college faculty since 2003. 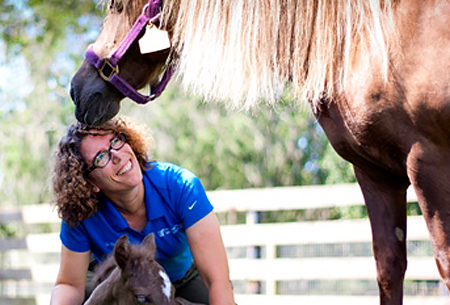 Additionally, since 2015, she has served as medical director of the UF Large Animal Hospital. She received both her D.V.M. (’95) and Ph.D. (’03) degrees from the UF and has been a longtime member of the college’s Alumni Council. She completed her residency in large animal internal medicine in 1999 and obtained her board certification that same year. In addition to her clinical and didactic teaching experience in large animal medicine, Dr. Sanchez has played a key role in various aspects of communication instruction to veterinary house officers, staff and students. Her research focuses on three main areas: equine gastric ulcer syndrome, pain management in the horse and critical care of equine neonates. Her laboratory has evaluated the effectiveness of various drugs for the treatment of gastric ulcers in foals and adult horses and for pain management in adult horses. Over the years, Dr. Sanchez has earned several awards in recognition of her research and teaching, including Large Animal Clinician of the Year in 2005, 2010 and 2011; the Florida Veterinary Medical Association’s Clinical Investigator Award in 2007; the college’s Excellence in Doctoral Studies award in 2003; and Large Animal Resident of the Year in 1999.